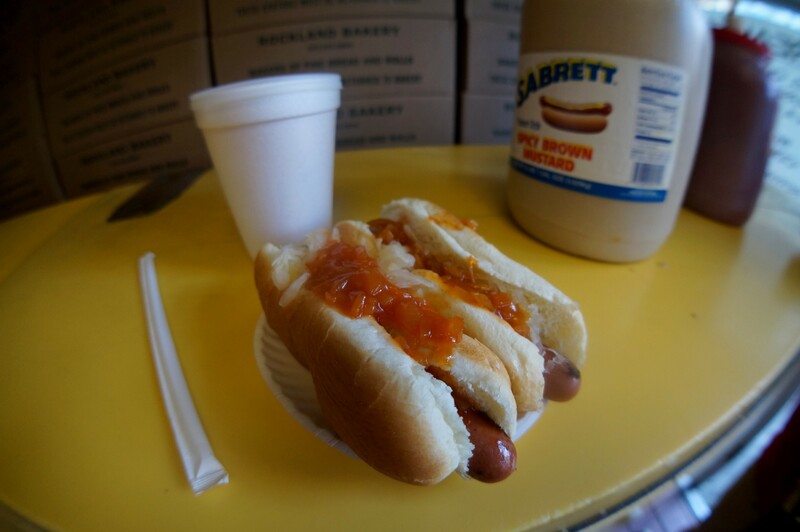 Classic New York Hot Dog: 100% American beef with sauerkraut and onions on a soft bun. May 31, 2014. Aneil Lutchman. Hot dog cart on East 16th Street in New York City. October 23, 2007. Rollingrck. “Baseball, hot dogs, apple pie and Chevrolet.” That was the tagline of an old commercial. Hot dogs are known for being a quintessentially American food, especially associated with sports stadiums. 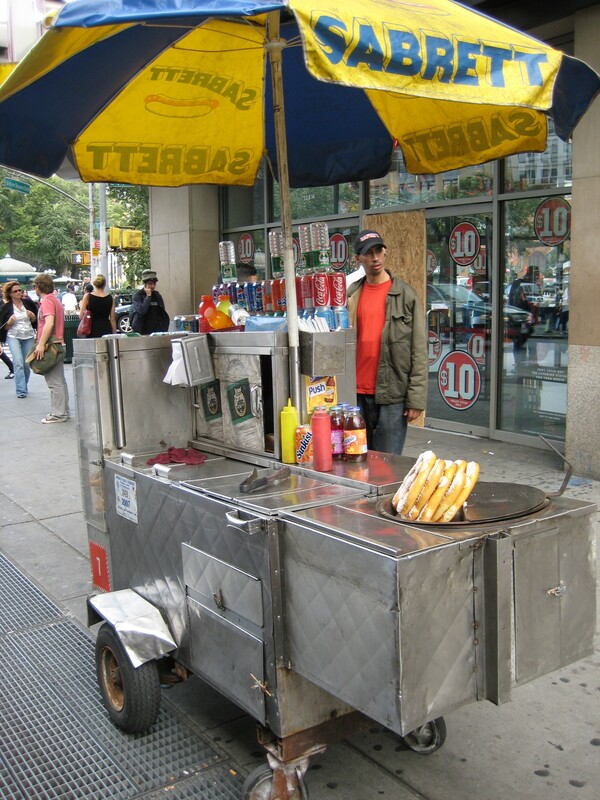 In New York City, hot dog carts are considered iconic. But how American are they? Sausages have been around since the ninth century B.C., and were even mentioned in Homer’s Odyssey. Hot dogs are a type of sausage also known as frankfurters or wieners. This particular soft sausage, made from pork byproducts in a thin casing, was first developed in Frankfurt, Germany in the late fifteenth century, hence the name frankfurters. Legend has it that in the 1690s, a butcher in Colburg, Germany notice dthat frankfurters were similar in shape to his dachshund dog. He started calling them dachshund sausages. However, since hot dogs are also known as wieners, Austrians claim they were invented in Vienna in the late 1800s. By the mid-nineteenth century, it was a common practice to eat frankfurters in a bun. This practice was brought to America by German immigrants, not invented here, and they may have already referred to them as dogs. There are variations of a famous story about how the first hot dogs were invented in America, but they are probably not true. The main rendition is about a man named Feuchtwanger. He was selling hot dogs on the streets in St. Louis (or some say at the World’s Fair) sometime in the late 1800s and would loan people gloves to eat them with so as not burn their hands. However most people never gave the gloves back. When he ran out of gloves, he talked to either a local baker, his wife, or brother-in-law who gave him some long buns he split down the middle. However, there is a lot of written evidence that hot dogs were already around. The writer H. L. Mencken wrote that he had been eating hot dogs since his childhood, in the 1880s, and they were not considered new then. There are many mentions in Harvard, Yale, and Princeton magazines from the 1890s about “dog wagons” near the colleges. Apparently, they were called “dog wagons” since meat was considered low quality, but they were cheap, making them convenient food for students. So the story about the name “hot dogs” being invented in the early twentieth century by a newspaper cartoonist is probably not true either. Supposedly, Tad Dorgan was at a baseball game, polo match, or bicycle race at the Polo Grounds or Madison Square Garden, sometime between 1900 and 1906. A vendor was yelling something to the effect of, “Get your red hot dachshund sausages here!”, and it caught Dorgan’s attention. He drew a cartoon of the vendor for the New York Journal, but since he didn’t know how to spell dachshund, he just called them dogs; however, no record of this cartoon has ever been found. Ironically, wanting to serve something “truly American,” President Franklin Roosevelt included hot dogs on the menu for the visit of King George VI of England in 1939. It seems hot dogs have been sold in New York City for well over a hundred years. There are newspaper mentions of hot dogs being sold from push carts, with sauerkraut on a milk roll in the New York City Bowery in the 1860s. A German immigrant named Charles Feltman opened a hot dog stand in Coney Island in 1867, but it folded during the Great Depression in the 1930s. In 1915, a Polish immigrant working for Feltman slept on the floor of the restaurant to save money. A year later he had saved up $300, which he used to open his own hot dog restaurant in Coney Island. He competed with Feltman by selling his dogs for five cents, while Feltman’s cost ten cents. That enterprising young man was Nathan Handwerker, and his original restaurant is still in Coney Island to this day, with Nathan’s Famous Hot Dog restaurants located all around the country. Their celebrated hot dog eating contest started in 1972 and occurs every year on the Fourth of July. There is a story that a friend of Feltman’s named Donovan built him a small tin-lined chest with a charcoal stove inside to boil the hot dogs, similar to the hot dog carts we know today. Another claim for the first modern hot dog cart is from 1926. A man named Frances Coffey designed a stainless steel cart with a cooking plate, steam table, and ice box, according to the website New York Tour1. Today there are regulations controlling mobile food vendors, including hot dog carts. The dogs must be pre-cooked and kept in a pan of hot water, which is why they are often referred to as “dirty water dogs.” The carts must have a cooler for storage, and sinks for washing utensils. Most carts use propane for heating. Umbrellas are required to protect the food from the sun and dust, and there is a limit to the number of condiments carried. Vendors must be also trained in safe food handling practices and have their carts inspected by the city. While hot dogs are much beloved in the country (we eat about seven billion per year), they are also rather unhealthy. Traditional hot dogs are pre-cooked, made from beef or pork byproducts, fat, salt, spices, and preservatives (mainly nitrates). The World Health Organization lists nitrates as Group 1 Carcinogens. There are many alternatives produced to make them healthier, such as chicken, turkey, or tofu dogs. Most hot dogs we eat are of the skinless type. They are cooked in the skin, or casing, and the skin is removed afterwards. The customary New York City frank is a beef dog served with mustard and sauerkraut, and sometimes cooked onions in a thin tomato base, on a soft white bun. Different regions and stadiums tend to have their own signature style. In Chicago, hot dogs are buried under mustard, tomato, chopped raw onion, peppers, pickles, relish, and celery salt on a poppy seed bun. They like their hot dogs spicy in Texas; at Astros Field in Houston, dogs are sold with chili, cheese, and jalapeños. The “Fenway Frank” in Boston is boiled and then grilled, and served on a toasted New England-style (flat-sided) bun. The Atlanta Braves have their dogs topped with coleslaw. In Los Angeles, the “Dodger Dog” consists of a grilled ten-inch-long pork frank with ketchup, mustard, chopped onions, and sweet relish. Hot dogs have always been a convenient food to eat while walking around, at picnics, or at sports stadiums. New Yorkers sometimes refer to the street carts as “sidewalk gourmet.” While not very healthy, it’s one more traditional foods to sample while in a new city, or even in your own.